Thanks for waiting, and here it is: another compilation of weird medieval manuscript images from Medieval Codes researcher Courtney Tuck. The Luttrell Psalter (London, British Library MS Additional 42130) was created for Sir Geoffrey Luttrell, the lord of Irnham in Lincolnshire, England. It has been dated to 1276-1345 and it is currently housed in the British Library, which has digitized it for online access. 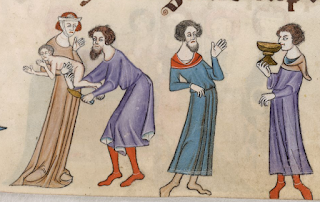 Sir Geoffrey and his family are depicted within the Psalter’s pages, as well as scenes of daily life. 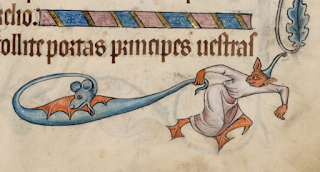 Those, however, are only some of the intriguing and entertaining marginal illustrations found in the Luttrell Psalter. 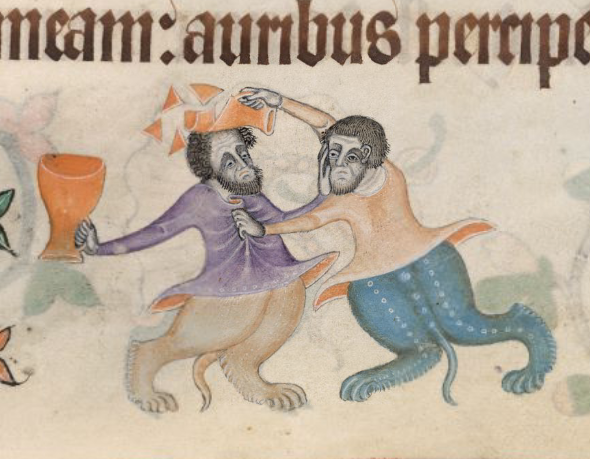 As I had previously created a top ten most memorable marginal illuminations from the Macclesfield Psalter for an earlier blog post, I attempted to do the same for the Luttrell. This, however, would not be as easy a task due to the large amount of memorable illustrations. The first list I attempted to compile had over 70 images in it. While all were interesting, I thought perhaps that would be too much. I persevered and was able to narrow it down to 25 of the most memorable images. As I was working through this manuscript I was actually able to use the images as mnemonic devices in case I lost my place, which was one of their original functions. There was one word that I kept using to describe these images: wacky! Many animal-human hybrids as well as invented creatures get up to hi-jinks and even interact with humans within the margins. 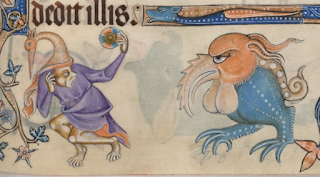 Let us take a look at these top 25 most memorable images from the Luttrell Psalter, as well as how they have been perceived by my modern mind. 25 - This horse/human/bat hybrid is standing in a saucy contrapposto position. We could all take a lesson in such confidence and effortless style. Work it, you feisty creature, you! 24 - This disembodied head is devouring one creature as vines sprout from its ears. Its eyes are seemingly devoid of any emotion or reaction, so you can't even tell if he’s enjoying the taste or not. 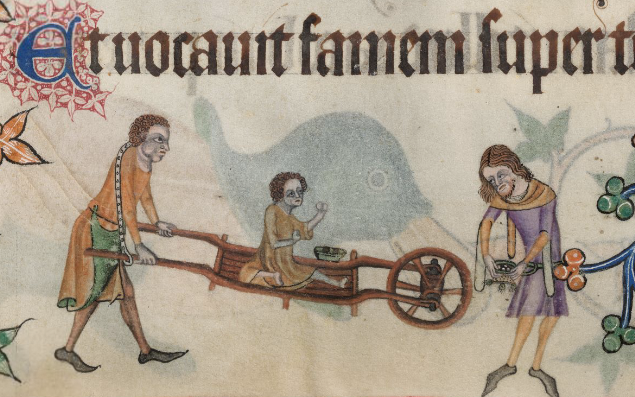 23 - This is what medieval parents did before strollers were invented. Just stick your kid in the wheelbarrow with a snack. Trend watch! 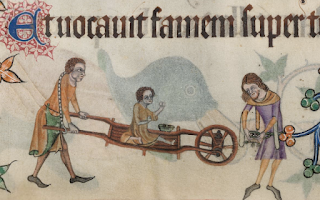 Hipsters will soon reject those fancy schmancy strollers and go back to ‘old school’ wheelbarrows. 22 - This is the type of mythical creature I would have designed as the ultimate pet as a child. Part unicorn, part flowering vine and beautifully webbed feet. I would name him…… Gil Faizon. 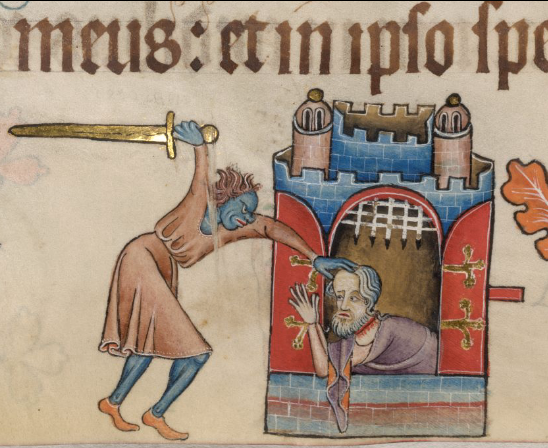 21 - This beheading-of-a-saint scene is not the only one that can be found in the Psalter. The aggressor is a greenish-blue man, which is odd, though it may be the artist’s way of making him the ‘other’. In case you weren’t sure, he’s the bad guy. 20 - Just a gremlin taking his mouse-creature out for a walk….as one does. 19 - Another greenish-blue person acting as aggressor. 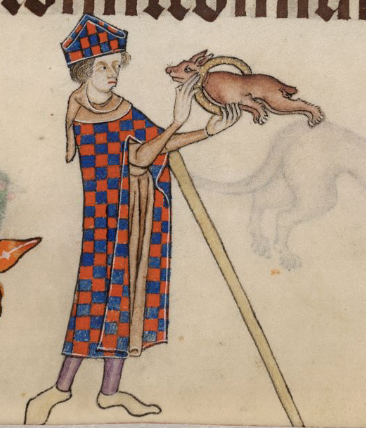 This time he is slaying some sort of grotesque. The look of hate in both their eyes is pretty intense. 18 - This bird-like grotesque is so adorable. 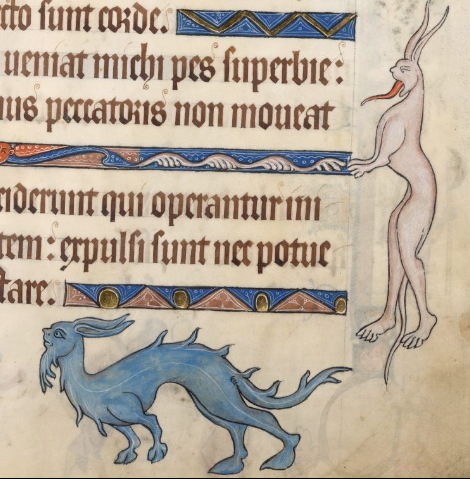 I feel as though the artist that illustrated this manuscript has done an amazing job at creating engaging creatures that seem ahead of his time. The goat pictured here doesn’t even seem to notice or care as he nibbles on some foliage. Look behind you, goat! This beast is amazing! 17 - This image helped me when I lost my place at one point. Oh yeah! The page with the guy prying open the mouth of a lion. There it is! I could get used to this kind of system for navigating through books. 16 - The look of sadness on the face of the guy poking his head out of the mouth of this frightening grotesque truly makes me feel pity. I’m afraid no one is coming to help you, guy. Accept your fate. 15 - This grotesque being utilized as a line-filler looks like Yoda’s tall, gangly teenage son. He’s even sticking his tongue out. What a goof! 14 - This guy is struggling not to meet the same fate as the sad guy in image number 16. I’m really rooting for him. The fact that he is already waist-deep worries me, though the look of determination on his face makes me think he might have a chance. 13 - This clergyman seems to be making the most of his time by training a small dog to jump through a hoop. That’s one way to pack the pews! 12 - This chase scene is so zany! The figure with the bird hat seems to me to be some sort of wizard. What is that medallion he is holding? This image could create the basis for a very interesting story. I could stare at it for quite some time and still be entertained by it. 11 - These creatures also fall into the category of animals I would like to keep as a pet, especially that blue one with the cool beard. He almost looks like a luckdragon. Is there any other appropriate name for a luckdragon than Falkor? Probably not. 10 - Pew! Pew! Pew! Nothing beats an imaginary laser gunfight! 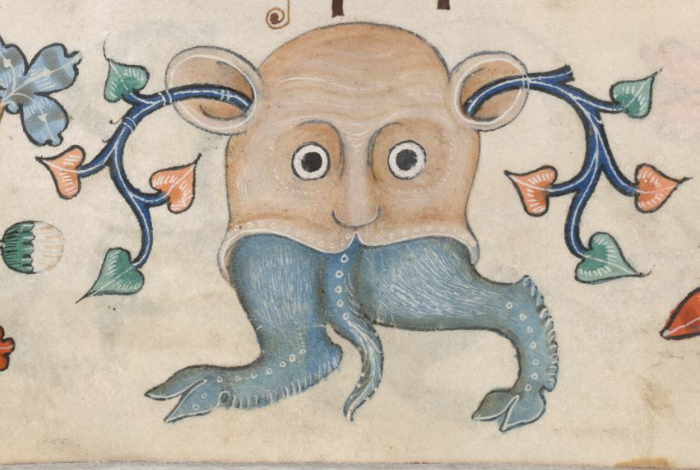 9 - Of all of the grotesques in the Luttrell Psalter, this one is the fiercest. It cracks the top ten simply on the value of the beast’s glower. 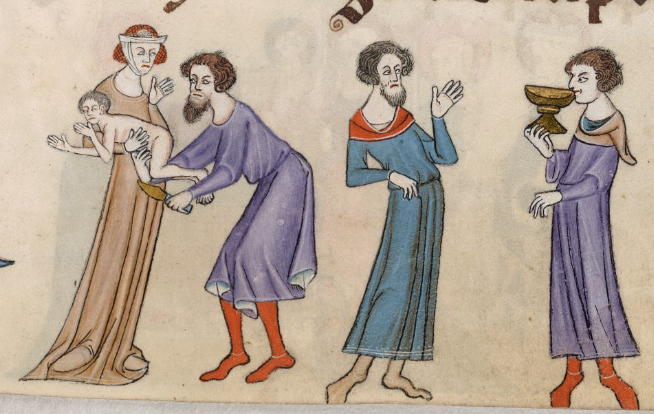 8 - Nothing livens up a manuscript’s margins like a circumcision scene! 7 - This woman’s hairdo has turned out so well it has a jaw-dropping effect. 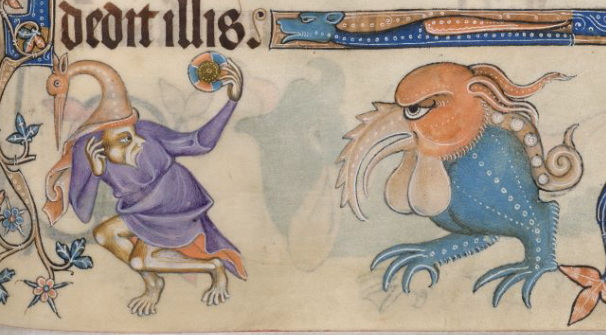 The grotesque is obviously impressed. 6 - These two human hybrids are so rowdy! Don’t invite these two out to the pub with you. 5 - The angel here is trying to explain something to this shepherd, who is just not getting it. 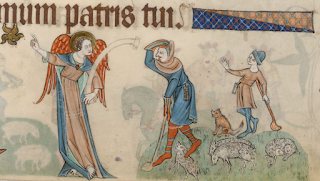 Perhaps the angel should not have found a shepherd who was such a dullard. 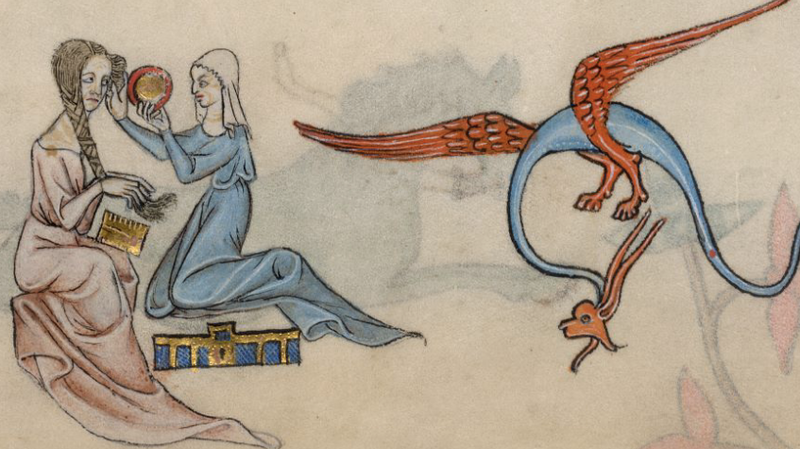 4 - Even sassier than the grotesque at number 25, this one has an ‘oh no you didn’t!’ attitude. There is something about this illustration that looks almost modern. The artist’s technical skill is quite apparent in this example. 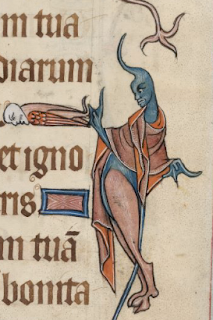 3 - This topsy-turvy image of an ape taking on the characteristics of a human are all wrong. 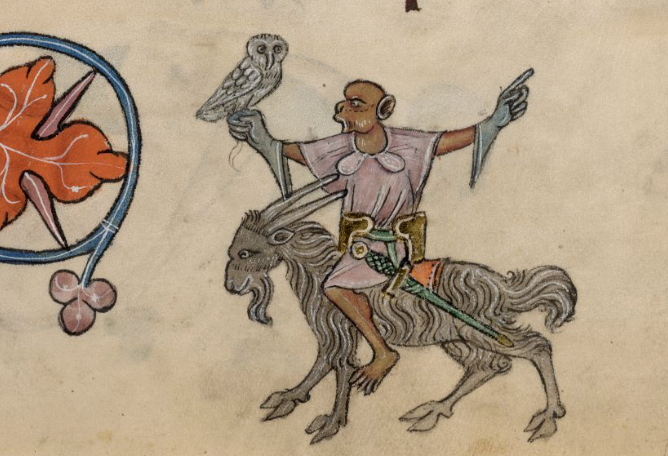 Instead of a horse, he rides a goat and instead of a falcon, he has an owl. Nice try, ape! You’ve been spotted as an imposter! 2 – This illustration is a lovely reminder about properly chewing one’s food. 1 - I’m not sure which image is better here. The two men either wresting or struggling to undress each other are quite humorous. 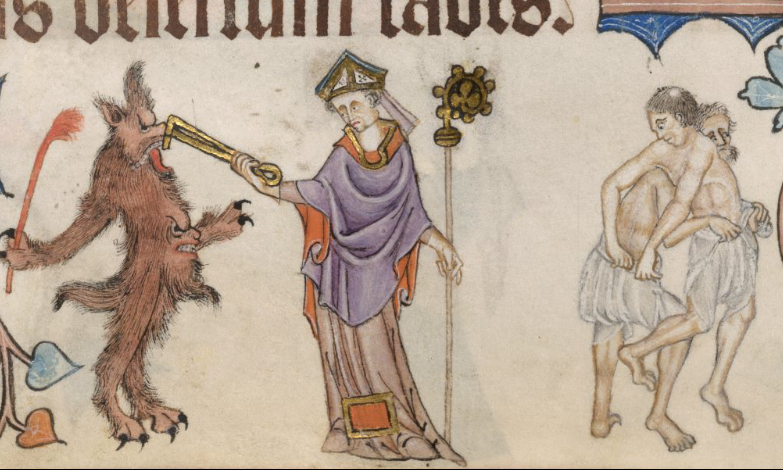 The bishop pinching a demon’s nose with tongs is also very entertaining. Good thing this demon has an extra face and an extra nose. Perhaps the bishop should have brought an extra pair of tongs. 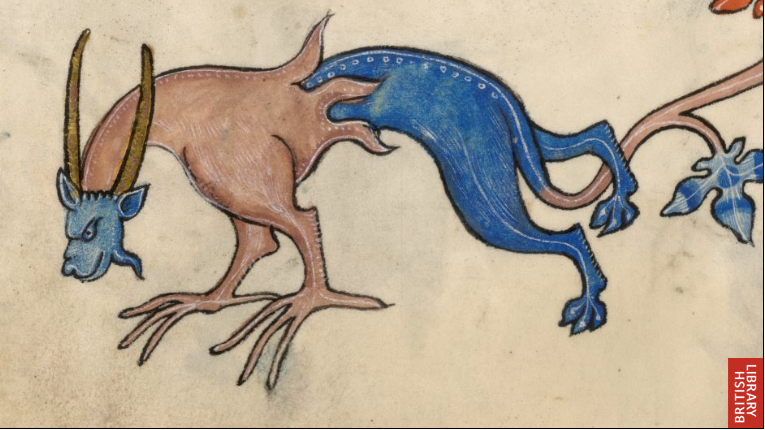 Brown, Michelle P. The World of the Luttrell Psalter. London: British Library, 2006. The Luttrell Psalter in full digital reproduction is available through the British Library website. 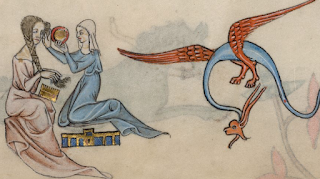 You can a selection of images, with commentary, as a Turning the Pages tour, or you can view the manuscript in full here.